The factory differential covers on the stock Dana 44 housings of the Jeep Wranger JK Unlimited are relatively weak. 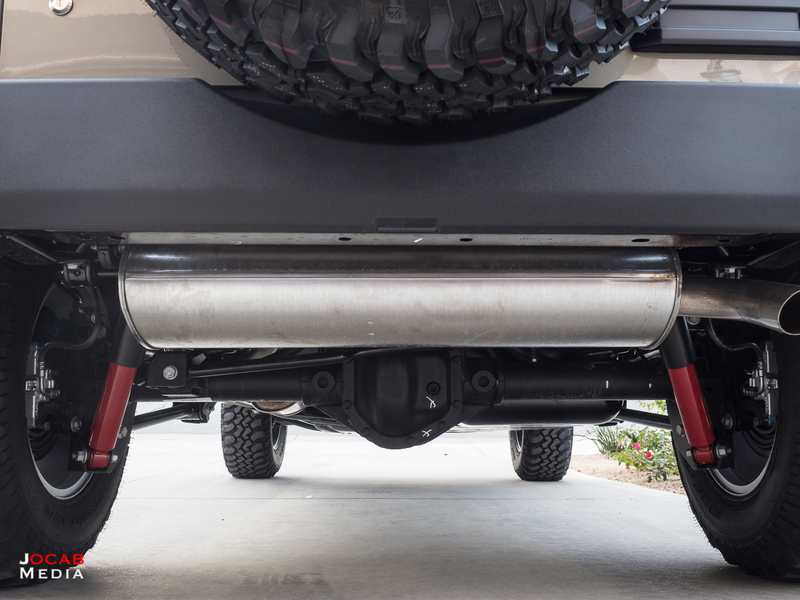 While the factory diff covers are steel, they are stamped steel and relatively thin. 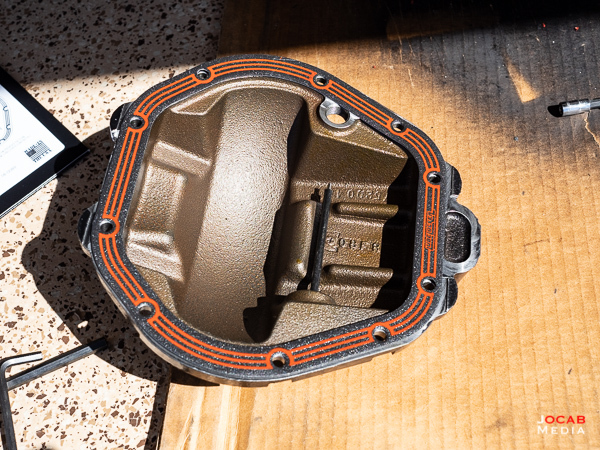 But more importantly, the design of the stock differential cover has a lip at the 6 o’clock position which is known to result in diff cover shearing or peeling when landing the rear differential housing on a rock or other obstacle. 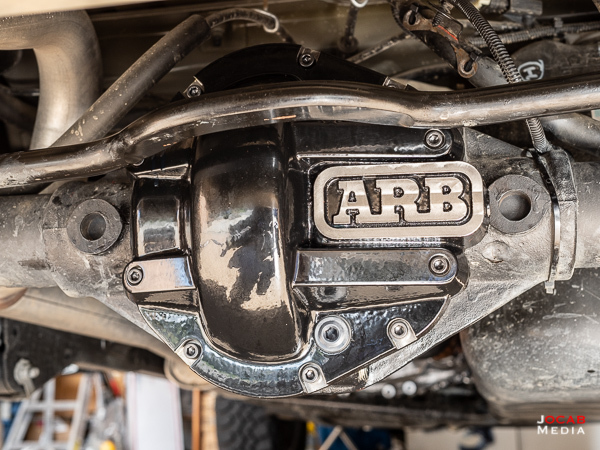 I decided to pick up the ARB Dana 44 differential cover which is a popular well-known aftermarket differential cover in the Jeep community. It is pricier than most at the $200 range, but is well design in terms of fill plug, drain plug, and magnets on both plugs to pull gear debris. It is also very stoutly built with lots of strength rigidity. The thicker and stronger differential cover helps add some rigidity the stock Dana 44 housing. Note: It is better to get the differential oil warm before draining. 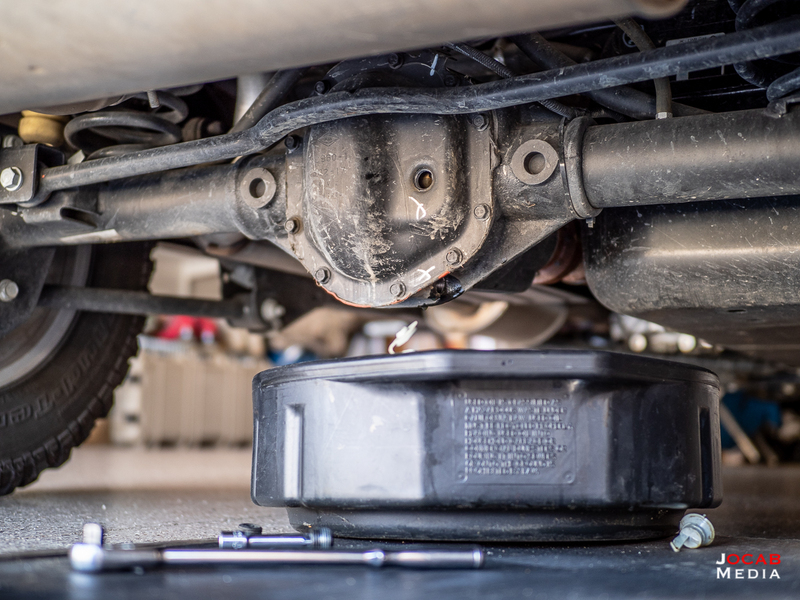 Drive the vehicle at highway speed for at least 10 minutes to get the gear oil warmed up. After draining the differential oil for several minutes, I pulled the stock diff cover off. Removing the bolts does require some maneuvering around the track bar. Depending on your suspension, the track bar may block straight access to some of the differential cover bolts preventing the use of ratchet or an impact wrench. You could just use a (13mm) closed end wrench or a ratcheting wrench. But I opted to jack up the Jeep on the frame (near the rear control arms) to get the axle to droop from the body and make clearance to the differential bolts. This is the better option so you can actually clearance for a torque wrench on all the bolts when installing the new diff cover. After the bolts were off, I had to pry the cover off due to the dried sealant between the differential cover and differential housing. This required using a hammer and tapping very hard on a flat head screw driver between the diff cover and the housing at the 3 o’clock position. The RTV / sealant used is quite strong. Once the screw driver is wedged between, prying the diff cover off was fairly simple. After that, cleaning up the differential housing surfaces was necessary for a firm gasket fit (or new sealant to form). I used a plastic scraper and 0000 steel wool. I decided to use a Lube Locker gasket as opposed to a bead of RTV all around the mating surfaces. People like the idea of a Lube Locker gasket because it is reusable. I like the Lube Locker because it is less messy to deal with during install and when having to remove the diff cover. 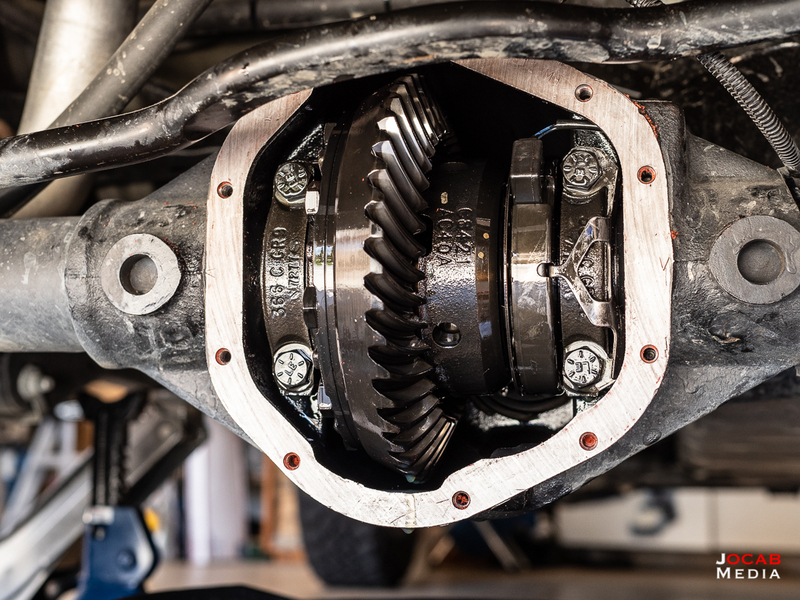 Bolting the ARB Dana 44 Differential Cover was relatively simple. Tipping the scales at around 10.6 lbs, the ARB diff cover is heavier than the factory cover ( ~3.4 lbs for the OEM cover), so I did have to support the cover underneath while I threaded in two bolts to keep the cover on the housing. After torquing the ten differential bolts to 25 ft-lbs, thread on the differential housing drain plug (not torqued yet), and securing the differential cover drain plug (hand tight with hex key), I filled the differential with a quart of 80w-90. I let it sit for several minutes then immediately drained the oil to get out any errant particles that got into the differential housing while the diff cover was off (and during gasket cleaning). Then I reinstalled and torqued the differential housing drain plug (25 ft-lbs) and then filled up the differential with around 2.1 quarts. Note that factory spec indicates around 2.375 quarts for the Dana 44 rear housing, but with the stock cover. The ARB differential cover uses a dipstick to measure fluid levels which needs to be indexed against the fill hole of the factory cover. Based on this method (defined in the ARB installation manual), I only needed 2.1 quarts. Note that I am sticking with conventional differential fluid. Based on the various testaments I have read on the Internet, it appears conventional is better for heat transfer from the gears to the oil to the differential cover. Thus, I am continuing to use conventional Pennzoil 80w-90 differential fluid / gear oil. I have not replaced the front cover because I am still running a stock Rubicon suspension. Due to possible clearance issues with the front track bar, I am waiting on replacing the front cover. After I decide it is time to do a lift (and install the lift), I will upgrade the front differential cover.